(Petunia) Supertunia® Cotton Candy Petunia is a fast growing, beautiful, candy-pink color petunia. 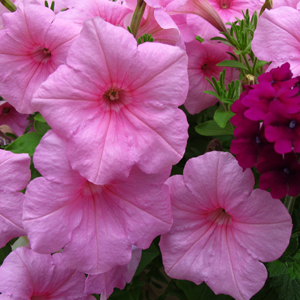 The trailing habit of Supertunia® Cotton Candy makes this a great choice for hanging baskets and combination planters. A self-cleaning petunia so no deadheading is necessary. Petunias are a fragrant flower that attract hummingbirds.